We've been working very hard on improving the Themify framework. For those who are not a big fan of TimThumb, we have a good news in this latest release. Now you can use the WordPress generated thumbnails for the post image instead of the TimThumb script with our themes. Below are the details about this update. Themify themes uses WordThumb (similar to TimThumb script) to generate thumbnail images with different dimensions on the fly. However, some users are unable to use the image script due to server compatibility. Users have always been able to disable the image script via the theme option panel, but then images have to be manually cropped before uploading to the server which can be an inconvenience for some users. For this reason, we enhanced our framework to allow you to select the thumbnails that are generated with WordPress. With the new version, once the image script is disabled, a dropdown will be available for you to choose which image size to use. 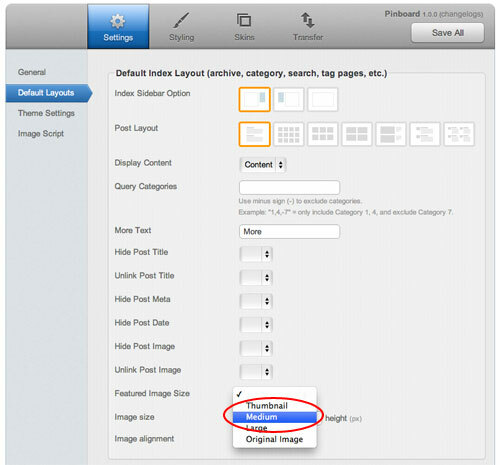 The image sizes (thumbnail, medium, large) can be set at WordPress Media Settings. In other words, you can specify 250 x 250px medium size to be used in the archive pages and 560 x 300px large size for single post page. We've also integrated a regenerate thumbnails feature in the framework. The regenerate thumbnails allows you to re-generate a new set of thumbnails that are already uploaded to the blog. This tool is useful if you've changed any of the thumbnail dimensions on the Media Settings page. In this new framework version, the post image uploaded via the Themify Custom Panel will be attached to the post and set as the WordPress Featured Image automatically. For those who are using the older versions where a custom field was used to handle the post image, you can use the Post Image Migrator to convert the Post Image custom field to WordPress Featured Image. Along with many new parameters added to the shortcodes, we've added a shortcode button on the editor to make inserting shortcodes easier and faster. Now you can specify the shortcode parameters using the visual dialog box.